Growing up in the north-east makes is hard for young aspiring baseball players to get noticed. There was no exception to this rule for Chris Bostick, a young talented infielder from Rochester, New York. Bostick not only had to battle tough opponents but also tough weather conditions during the early spring baseball season just to get on the baseball field. Growing up in the northeast makes it hard for young aspiring baseball players to get noticed. There was no exception to this rule for Chris Bostick, a young talented infielder from Rochester, New York. Bostick not only had to battle tough opponents, but also tough weather conditions during the early spring baseball season just to get on the baseball field. In high school, Bostick starred for Aquinas Institute during his amateur career. Each year he raised his batting average up from .490 his Sophomore year to .510 his senior year. Bostick had to battle the harsh weather conditions that left fields unplayable and sometimes covered in snow. While many players in warmer climates saw a full season of action Bostick saw limited action and at bats playing in just 17 games his senior year. While these conditions did prevent some scouts from planned trips to see his games it did not prevent all of them from getting a glimpse of Bostick’s abilities. Beyond the scouts, Bostick had his sights set on playing baseball and continuing his education at St. John’s University. It was not until the third day of the 2011 draft that Bostick heard his name called by the Oakland A’s in the 44th round. While most players from the high school ranks who get drafted late move on to their desired colleges this was not the case for Bostick. The A’s thought very highly of the talented infielder from New York and they offered him a reported $125,000 signing bonus to join their organization. Bostick celebrates a home run vs the Frederick Keys during a comeback win May 1st. Bostick jumped into game action in early August with the A’s Arizona League team splitting time between shortstop and second base. At the plate he hit an astounding .442 in 57 plate appearances and finished the season with a OPS of 1.136. After starting the 2012 season in extended spring training working on different aspects of his game, the A’s assigned him to a familiar place. 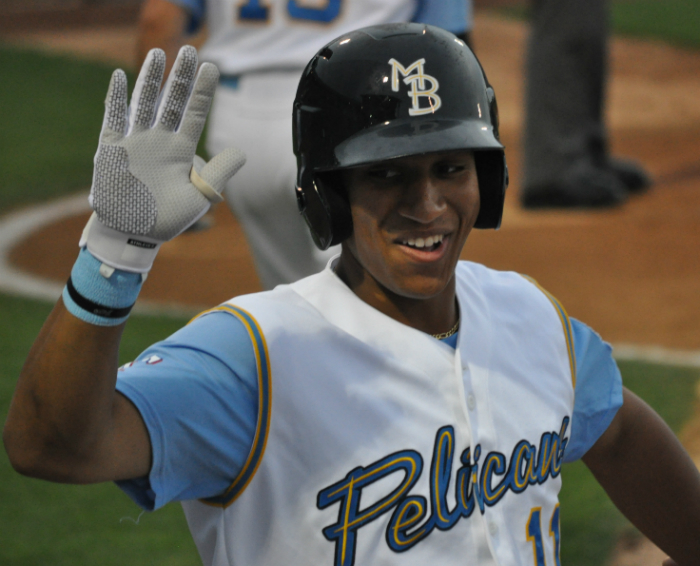 Bostick would be playing back in the northeast with the Vermont Lake Monsters of the New York/Penn League. As a member of the Lake Monsters, he once again found himself splitting time between shortstop and second base, although the bulk of his playing time came at second base. At only 19 years of age, Bostick was two years younger than the leagues average aged player and held his own against opposing pitchers. The infielder produced a stat line of .251/.325/.369 in 316 plate appearances and also showed some speed swiping 12 bases in 17 attempts. The A’s continued to be aggressive with Bostick to start the 2013 season promoting him up another level to their Midwest League Affiliate, The Beloit Snappers. As a member of the Snappers, Bostick appeared exclusively at second base as a part of the talented Snapper infield. Bostick excelled at the plate and with the glove while being one of the younger players in the Midwest league. With the glove, Bostick posted a career best .963 fielding percentage as he focused solely on second base. With the bat, Bostick showed power hitting 14 home runs while driving in 89 runners in his first full season of affiliate baseball. Bostick hit .282 on the season and finished the year with an on base percentage of .354. Bostick appeared on the path to a new level and new challenges with the Oakland A’s as the 2014 season neared. The on December 3rd, an off-season trade caught the young infielder by surprise. On this blustery Decemeber day, Bostick received word that the A’s had traded him along with another talented player, OF Michael Choice, for two players with established major league resumes in OF Craig Gentry and P Josh Lindblom. Bostick’s 2014 chapter would be written as a member of the Texas Rangers. Bostick joined his new organization for spring training and the Rangers kept moving Bostick forward. He was assigned to the Rangers Carolina League affliate, The Myrtle Beach Pelicans which moved him one step closer to the majors. At just 21 years old, Bostick would once again be facing competition as a whole which was older and more experienced than him. After getting off to a slow start to the 2014 season, Bostick picked up his game during the first half of the 2014 season hitting seven home runs and 22 extra base hits in 255 at bats. Up to this point in the season the second baseman’s batting average sits at .235 which dipped as the Carolina League All-Star break neared. As the second half of the season begins, Bostick hopes to raise his average back up as well as continue to show the abilities to drive the ball for extra bases and over the fence from time to time. We will continue to follow Bostick’s progress all season long. Be sure to follow him on twitter @leanonmeCB and follow us at @CTD_Sypien as we will provide updates on Chris all season long and into the future. 1. Tell us a little bit about your draft day? Where were you when you found out you were drafted? It was a cool experience, I was in my living room. I listed to all three days following along with it as it went along. It was honestly a couple of rough days because I was hoping I would have been drafted a little higher but that certainly did not take anything away from the excitement of being drafted and hearing my name. From where I am from (Rochester NY) it’s not really a common thing for a high school or college player to be picked in the draft. 2. Being from the state of New York, Do you feel that its harder for players like yourself to get noticed? I think it’s a bigger downfall than what people think. Not only is it tough to get yourself noticed and but it’s just tough to even get games in during the high school season. I only played 17 games my senior season due to the weather. There were times when a scout or someone wanted to come to one of my games and I would have to call them and inform them the field was under water and we weren’t going to be able to play. It makes it really hard when someone had it in their schedule to see you play and you don’t end up ever playing. 3. Was it a tough decision for you to bypass the chance to play college baseball at St. John’s and turn pro? It was, I was really academic in high school and I took a lot of pride in how I did in school. It was a difficult decision and college is definitely an important thing for me. Although I bypassed college, I still take online classes and do everything I can do to get my degree. It really was difficult deciding what I wanted to do but when It came down to it I didn’t want to pass up an opportunity that not many people get. I didn’t know if I would get this opportunity again so I took the chance. I know I can go back to school at any time. 4. What was the biggest adjustment for you going from high school to the professional ranks? The game is a lot faster, everything happens fast. The competition was much better than what I was used to. It was a difficult adjustment at first. The guys I’m playing against in the pro’s are the best of the best and they are chasing the same dreams that I’m chasing. Another big adjustment was going from only playing 17 games my senior year to playing 17 games in 17 days at the professional level with no days off. 5. After a successful 2013 season in the Oakland Athletics organization you were traded in the off-season to the Texas Rangers. Did the trade take you off guard? Every player coming into this understands that being traded can be apart of the game. In today’s game the possibility of playing for multiple teams over the course of a career is something that can easily happen. It definitely did take me by surprise though. I wasn’t expecting to get traded. It was just a regular day in December when they called and told me that I was heading to the Texas organization. It’s a bittersweet feeling because you make a lot of great friendships and get comfortable with the way things are done in one organization and then you have to start over building those friendships and comforts again. At the same time Texas did something to get me, they wanted me here. You realize as time goes on you keep some of those relationships from the past but you definitely make new ones. 6. What would you say is the biggest difference between your time in the A’s organization and now your short time in the Rangers organization? There isn’t really any huge difference between the two organizations. You can tell Texas is a higher budget team and Oakland is a team that operates on a lower budget. Other than that they each have the same type of system and their coaches are working towards the same type of goals. I’m sure there are some organizations that are cut out differently and have more rules but my time here hasn’t been much different from my time with the A’s. I’ve been really fortunate over the course of the past few season to have some great coaches who have helped me with my development. Both the A’s and Ranger have great coaching staffs who care for you as a person and a player. Whether you need help on the field or off the field they are their to help you. 7. The second half of the Carolina League season has just got underway. How would you evaluate your performance so far this season? I think its went good so far. Obviously the numbers might point a bit differently but I think I’ve still had a productive first half. I’ve taken strides and I’ve gotten better as a player throughout the year. I’ve learned a lot about myself and what I need to do. When it comes to numbers, I had a bit of a rough start to the season and a rough end to the first half. If I could take those two extremes away I’ve been pretty productive this season. I’m upset about the number of strikeouts and I’ve made a few more errors than I wish I would have but I’m excited to start the second half and put some of the things I’ve learned so far into play. 1. Favorite baseball player growing up? Why? 2. Playing in such a tourist destination as Myrtle Beach do you have a favorite spot you enjoy getting a bite to eat when you’re not at the field? There is a place not to far from the field and the beach called SoHo. It’s a nice Japanese hibachi and sushi type place that’s probably my favorite place I’ve been to so far during my time here. 3. What has been your favorite stadiums to play at so far in your career? Dayton (Midwest League) was a cool place to play at, they have such a great atmosphere. They are known for that, they have a streak going for sold out games. Myrtle Beach has been a wonderful place to play too. It’s not known as too good of a hitters park but it is always a good atmosphere, there is always a good crowd at the games and they do a really good job here keeping the fans involved. 4. What is your walk up song and why did you pick it? My walk up song is Mr. Boombastic by Shaggy. Everyone has taken a liking to it. They call me Christopher Boombostic here and its been a funny thing. The fans seem to like it and the players like it. It gives everyone something to smile to when I’m going to hit. A special thanks to Chris Bostick for taking some time out of his busy in season schedule to chat with us and also to Nathan Barnett for making the interview possible. We look forward to following Chris all season long and into the future. 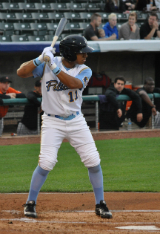 Please remember to give him a follow on twitter @leanonmeCB and like Chasing MLB Dreams on Facebook and follow us on twitter @CTD_Sypien as we continue to feature and follow all of our featured players as they chase their way to the major leagues.